There are few satisfying smells than fresh baked bread with a meal. Homemade bread can be an entire day’s task that you don’t have time for or for which you did not plan. You can still have the satisfaction of fresh baked bread on the table in 20 minutes flat. 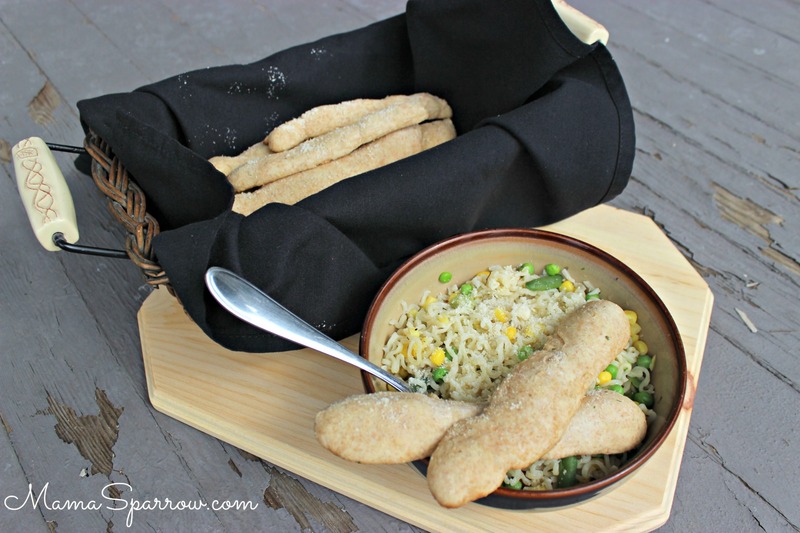 These bread sticks only require about 5 minutes of hands-on time. Also, included is my first posted recipe video. You can catch the video over on YouTube too. I can’t help be also share that the music in this video is by my talented husband. *cheesy smile*. Hope you get a chance to whip these up with an upcoming meal. Please be sure to tag Mama Sparrow on social media with your pictures. We would love to see your results. Preheat oven to 450F. Melt 3 Tb of butter on the baking sheet in the oven while it preheat - about 2 minutes. Take out just before all butter is melted and tilt the pan several times till it finishes melting. While butter is melting, combine the dry ingredients in medium size mixing bowl - flour, baking powder and salt (also add the granulated sugar at this point, if using instead of honey). Slowly stir the milk into the dry ingredients. Sprinkle additional flour over the dough so it is workable and gently knead a few times. The dough should still be fairly wet, but just enough flour to pull apart and shape into 12 breadsticks. Place the breadsticks onto the baking sheet of melted butter and brush butter from the pan onto the exposed surfaces of the breadsticks. Sprinkle a little garlic salt over the sticks and bake for 8 minutes or until golden brown. Sprinkle with grated parmesan after breadsticks finish baking and serve warm.